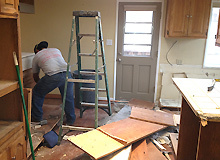 Before any remodeling project can begin, there is always going to be some demolition required. Depending on how far you are taking your kitchen renovation project, that could mean simply removing the countertops or stripping the room down to the bare studs. For many homeowners, the demolition can easily get out of hand when hammers and pry-bars are flying around. While it may be a good way to get our your aggression, it could result in more problems than you had before. Taking your time and actually disassembling the room versus demolishing it, is the smart way to go. Here are 7 steps to remodeling your kitchen. If you are going to around any electrical outlets or plumbing, it is important to make sure that both are turned off. As we all know, accidentally hitting an electrical wire can prove painful, if not lethal. While hitting a water line may not be lethal, it can sure cause a lot of headaches and a big mess. For example, if your floors are in good shape, and you plan to keep them, it is important to cover them. The last think you want to do, is damage something during demo or construction and increase your overall remodeling budget. If you are planning to keep any of the lighting fixtures, knobs, faucets, etc.. it is important to remove them and put them in a safe place. That way, when you are wildly swinging that hammer, you damage any of the fixtures you were planning on keeping. In most cases, you can usually save and re-use the moldings and trim that you will find in the room. By removing them now, you will prevent any accidental chips or dings when removing the countertops and cabinets. Once you have the trim removed, start working on the countertops. Depending on the type of countertop material, it may be as simple as using a utility knife to cut the caulk or paint between the countertop and the backsplash and cabinets. For laminate or other artificial materials, you may also have to remove any screws that are holding the countertop to the cabinets. It is usually a good idea to have some extra hands to remove the countertops, but if you are trying to do it yourself, and it is a material like laminate, you can usually chop it into manageable pieces that you can haul out on your own. Start by removing the drawers and any movable parts on your kitchen cabinets. Once you have that off, it is time to climb into the cabinets and remove any of the screws that are anchoring the cabinets to the walls. After the base cabinets are free from the walls, it is now time to separate them from each other. Most base cabinets will be secure with screws as well, so by removing those screws you will be able to separate and remove all of the base cabinets. 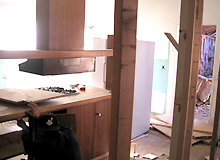 When it comes to removing the wall cabinets it is a good idea to have an extra set of hands or a brace to support the cabinets. Unlike the base cabinets, this time start by removing any of the screws that connect the cabinets to each other. Once those are removed, you can start pulling out the screws that are holding each cabinet to the wall. By starting the wall cabinets with the screws that are connecting them to each other, you can safely remove each cabinet individually.